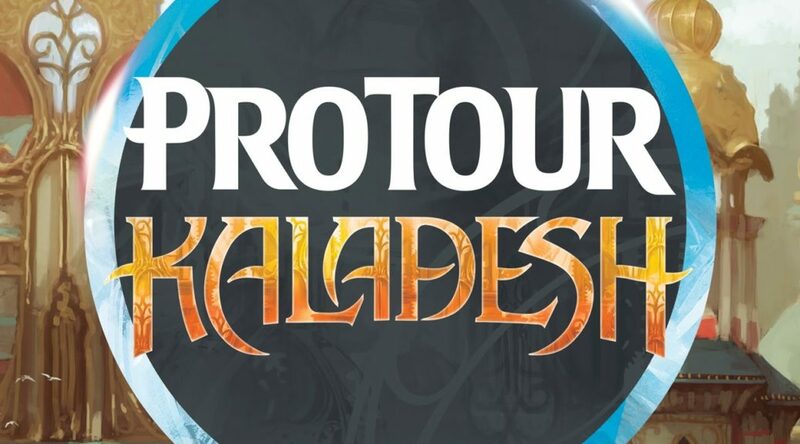 Check out our Pro Tour preview over here, and join us for round to round coverage in live blog style below all day. Round 4 (1st Round of Standard) started at 8pm EST/5pm PST, Friday, October 14th. Right of the bat we have Muller bringing Metalwork Colossus to the forefront in a Temur brew that veers off from the UB varieties that have been in evidence on Magic Online this week. It is Yasooka that draws first blood however, taking Game 1 on the back of Torrential Gearhulk, which is already showing signs of a spike. Mueller strikes back in Game 2 to even things up. Yasooka takes Game 3 and puts Grixis Control on the map for this format, running four Thing In the Ice, a card that has been languishing in the $5 range. This brew is running elements of WR Vehicles with Depala and Copter, as well as Scrapheap Scrounger and Unlicensed Disintegration. Tian loses the first game, but takes the second one. Off camera, Oliver Tiu has a turn 4 Emrakul in play off of Aetherworks Marvel. Aetherworks Marvel is drying up at online retailers but we’ll have to see if Marvel can weather the storm of aggro decks that still seem to be out in force. Torrential Gearhulk just took the crown from Smuggler’s Copter for most valuable Kaladesh card on #mtgo. Will it last? Pierre Dagen is running a Dynavolt Tower deck. Levy is on a Blue-Red Emerge deck that eschews the green cards usually seen in similar decks in favor of more meta specifics answers and recursion from Advanced Stitchwing. Game 1 goes to the Hall of Famer, as Levy leverages recursive pressure and some burn spells to close it out. In Game 2, Levy starts on two copies of Sanctun of Ugin. Dagen boards in Thing in the Ice and Niblis of Frost, to help with board control against the recursive plan of his opponent. Dagen is running Take Inventory, another first on camera this season. A Torrential Gearhulk later, and Levy packs it in to try and preserve his clock for Game 3. Game 3 finds Levy in need of a mulligan, but he does manage to find his lands on the next hand. Levy gets Dagen down to just two life, but Dagen is able to use Niblis of Frost to stave off the final points of damage for several turns and takes the match. This match is mostly showing off the aggressive decks that were expected coming into the tournament. Fairly telling that two names this big, that enjoy the benefits of testing with some of the world’s best teams, still chose to go this route. Under intense pressure, Reid takes Game 2, and evens things out to one game each. Hendriks is running Thought-Knot Seer, Elder Deep Fiend, Metalwork Colossus, Skysovereign and various enabling artifacts. Carlos is on a fresh Jeskai brew, with Gideon, Ally of Zendikar, and Torrential Gearhulk. A key Void Shatter prevents an incoming Colossus, and acts as turning point for the game and we move to Game 3. Dynavolt Tower back on camera in an impromptu deck tech with brewmaster Chris Botelho on a deck he hilariously calls “FTTF 4000“. Dynavolt Tower is spiking on MTGO. LSV calls the Temur Aetherworks deck the most powerful deck in Standard, but notes that it is especially vulnerable to sideboard cards. In Game 1, Cox manages to get Emrakul on the table early on and Kibler immediately scoops with no hope of answering the most dangerous threat in the format. In Game 2 however, Cox has trouble finding an Aetherworks Marvel and Kibler puts him on a fast clock with early aggro creatures, that lets him even it up. LSV notes that Kibler is running multiple copies of Ceremonious Rejection out of the board as a splash. Game 3 Pat Cox uses Glint-Nest Crane to find the Aetherworks Marvel he needs to set up a win. Kibler has an aggro plan in action with Lathnu Hellion and company, but he is forced to let Cox search for a threat with his Marvel after forgetting to pay energy to keep his Hellion in play in a major punt. The Marvel activation fails to find a real threat, but Cox does get a green puzzleknot to boost his life and restock some energy. This sequence of events gives Pat enough time to take another swing with the Marvel, and this time he gets to choose between Emrakul or Ulamog. Cox goes with Emrakul, the Promised End and takes control of Kibler’s next turn as well as setting off a Kozilek’s Return from the yard. With no threats left, Brian is stuck without a way out, and yields the match. We move over to this match mid-game. 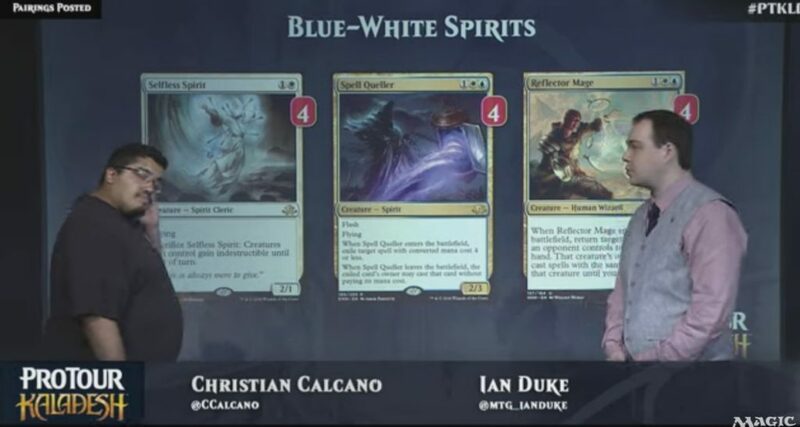 LSV notes that Watanabe is running Tamiyo, Field Researcher, but loses Kozilek’s Return based on his color preferences. Elsik is also running Dynavolt Tower as well as Nahiri into Torrential Gearhulk, flashing back Glimmer of Genius. These Jeskai lists also run multiple copies of both Wandering Fumarole, Needle Spires, and Spell Queller too. Elsik runs a value train and takes the game. In Game 2, Yuuya boards into a more aggressive plan with Longtusk Cub and manages to take the game relatively easily. Game 3 sees Watanabe with Tamiyo, Field Researcher in play in the mid-game, facing down some creature lands and a Spell Queller. Yuuya tries for a Spell Queller, only to have it exiled by a Spell Queller from Zac. The Japanese player has an Aetherworks Marvel in play, but with no other relevant permanents left in play and opponent holding a grip of counter spells that can interact profitably with the Marvel. Yuuya elects to hard cast Emrakul, which hits a counter from Zac, shutting down the Eldrazi threat, but opening the door for Yuuya to mess with his opponent’s board state by taking control of his turn off the cast trigger. Watanabe does manage to burn a ton of cards in Zak’s hand and remove some threats, but creature land attacks the next turn still manage to drive home a win, putting Zac Elsik to 5-1. The deck can’t even cast Prized Amalgam from its’ own mana base, relying entirely on graveyard recursion to pop it back into play after discard. 3/4 flyers in the deck often match up well against Copter. Levy details why he likes the blue flyers over Haunted Dead, due to their ability to apply significant pressure in the air. Game 1, Reid has his first threat answered by Immolating Glare, but a Veteran Motorist gets a Smuggler’s Copter in soon after, and the beat rush is on. Romao has a surprise Dovin Baan, a card thought to align poorly against the copter, but it does have the option to shut off an existing crew member by reducing its power to zero. A Selfless Spirit from Reid does allow him to crew up the Copter and clear Dovin from the board. Romao manages to counter a Depala, but Reid still gets in for eight, dropping the Brazilian to eight, and Reid takes Game 1 on the next attack step after adding Fleetwheel Cruiser to the board. In the second game, Duke brings the beats in equivalent fashion, and Romao again loses an early Dovin Bann to a massive attack. A Fumigate clears some of the threats but it leaves behind two clues, a Gideon and a Fleetwheel Cruiser and the control decks falls on the next attack step. Duke moves to 6-1. At a side table, Ari Lax takes control of a Grixis Zombies/Emerge deck via Emrakul, and pulls off a crazy sequence that shuffles dozens of cards back into Kentaro Yamamoto’s deck to deprive Yamamoto of future graveyard recursion options, leading to a quick scoop. Yamamoto does manage to take the match however on the back of two copies of Ceremonius Rejection in Game 3, putting him at 5-2. In a BG Delirium semi-mirror between Kenji Tsumura and Eric Froelich sees Gonti, Lord of Luxury stealing a Kalitas, Lord of Ghet from Eric for solid value. The Froelich build features Catacomb Sifter, a card that most players have left aside. Both of these players at 6-0 coming into this round. LSV calls out Aetherworks Marvel as the biggest splash of the tournament, an opinion underscored by the fact that the card is spiking over $20 at present. Spirits is still a thing in this evolving Standard meta. Calcano called out Gideon and Avacyn as excellent top of curve threats that are well adapted against the current meta. Deck is 3-1 in Standard at this point. In Game 1 Matteo whiffs on a couple of Aetherworks Marvel activations, and is overrun by consistent pressure from Eric. Game 2, Matteo manages to Ulamog, removing Froelich’s lands and casting a Kozilek’s Return out of the yard to clear the board and earn a concession. On to Game 3. Eric gets to 8-0 as Matteo ends up with too many giant Eldrazi stuck in his hand without a way to cast them, and without a hit off his Marvel, after a mulligan. Yasooka takes Game 1 with some Torrential Gearhulk/Unlicensed Disintegration action. Yasooka takes Game 2 as well, to go to 8-0, as one of the only undefeated players left on Day 1. Off camera these players trade a game each. In the final game Costa follows up a Veteran Motorist with Depala, with a Thing in the Ice on the other side of the board. Dagen is able to answer the threats with a combination of Niblis of Frost and some timely burn spells, and the French player goes to 8-1. That ends Day 1, and we’ve seen a good mix of new and expected decks. Join us Sat evening for Day 2 Standard coverage.